It’s summer, it’s August and Andreas has pharmacy night duty on a Friday …. that is the simple recipe for a great cigar week-end with friends arriving from all over to gather in the lab, the garden, the pub and enjoy the camaraderie and the sharing of fun, conversations and great cigars. First to arrive were Luca from Italy and Michel from Switzerland – by 10 am we were already smoking a cigar at my Cafe. Sadly Yannick was not along having to work overtime as always for his slavemasters .. We missed you, Blanquito !! I took Luca and Michel around the area through country roads and vineyards down to the Rhein river to Bingen where we took the car ferry over to the Rheingau and arrived at Vollrads castle to await the next guests, Christian, Jan and Michel from Belgium and the Netherlands. A sunny and great day it was and I welcomed them with an EL Lancero. Cigars were flying over the table as we tried to pass out cigars to each other, generosity in action. A long lunch ( and an even longer wait for Christian to taste and buy the excellent Riesling at the castle wine store ) and it was off to the village again and a visit to the Irish pub. I had a bottle of Vigia 18yr old rum that disappeared quickly down our thirsty hatches. A sleek and royal looking Rolls Royce arrived at the pub and out stepped Reza, the gentle bearded monster beast and Ina, the beauty. Great pair ! Along with Heiko plus Koen and his wife Marianna they made up this year’s neighbouring countries’ contingent. More friends joined us from all over Germany at the pharmacy as always and I was specially happy to see Paul, Dieter and Anja from the North. Not much sleep and up again for a long breakfast I had reserved at my local Cafe. That’s when some great, rare, new and vintage cigars started flying across the table … so many cigars, so much generosity, so little time. See the picture gallery for yourself. Michel was satisfied to get some shockingly long and red socks for himself and a lovely dress for his wife and even more so to see the Wilhelm v. Nassau monument, all surrounded by small wine and food stands as it happened to be the Rheingau Wine week. 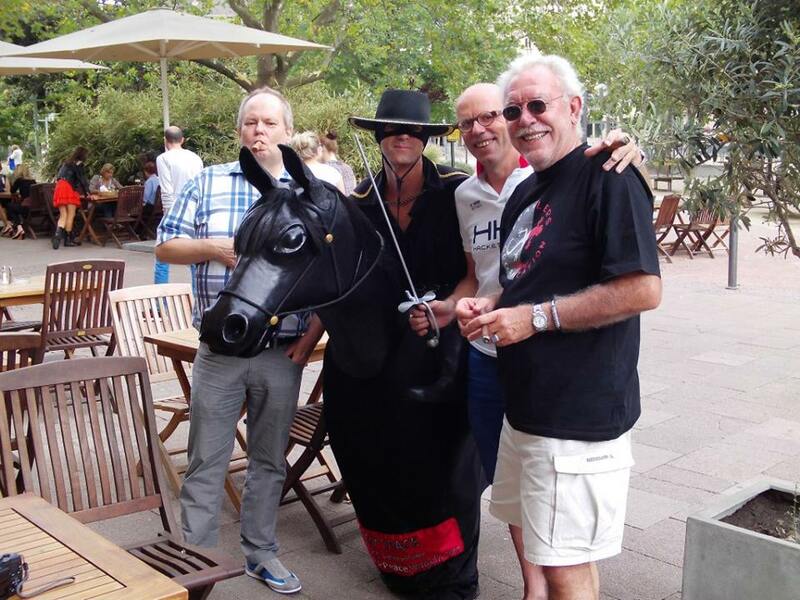 We had a pit stop at a very nice restaurant so Jan could relieve some pressure off his hurting back and while enjoying a fantastic Monte D were approached by … Zorro For Peace, a wonderfully friendly guy walking from Lisbon to Rome. That project made Christian drop to the floor …. It was then back to the village for a tasty Eiskaffee in the piazza and, the atmosphere being so … Italian, someone produced a La Escepcion jar. Really – now you understand what went on here. After some rest and dinner we all met again at the Irish pub for some more of the same. Andreas hosting us to Roseschorle, me handing out fresh Hector Luis Prieto farm rolled cigars and Michel handing out a vitola I had never seen before, Bolivar 108’s with some age. Delicious … so delicious indeed that a pretty young thing, rather make that : a VERY pretty young thing approached us for a cigar to try. After a short but brutal fight with the guys I won and was able to hand her a cigar and explain how to smoke it. 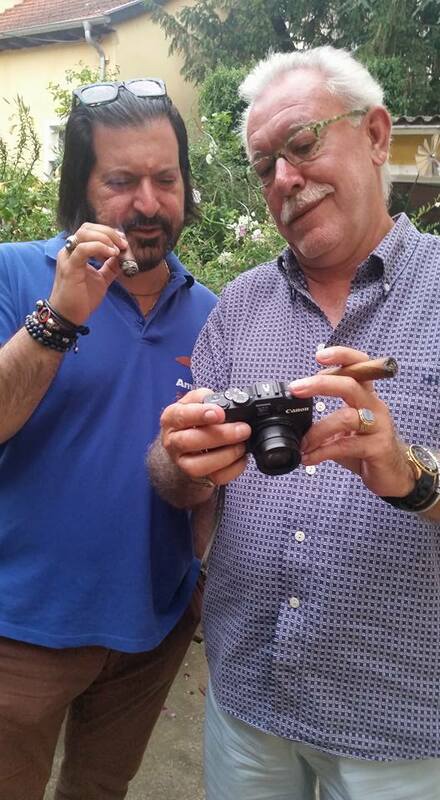 Love being an expert cigar guide …. The farewell brunch was held at the Mommenheim golf course and Josef made sure we had yummy Weisswürste, Leberkäse and Brezeln – a very hearty fare. The skies were sad that the cigar gathering was over and it rained – but smoking some fine Monsdales from Club Habana in Miramar we could feel the Cuban sun shining on us. Looks like a very good time. Sad that I had to sit this one out. See you Saturday my friends.